As I write, I am sitting in my mother’s condominium, while she is in the hospital recovering from pneumonia. I left my home when she was admitted nine days ago to come care for her and her dog. After being on a ventilator for four days, she’s began breathing on her own again, but it looks as though she may never return to her beloved home. Going back and forth from home to hospital, caring for Mom and the pup, and making life-altering decisions has left me drained — emotionally and physically. With my only sibling a thousand miles away, I have carried this weight alone. Almost. Some dear friends and an extended family member have come alongside me with encouraging words, meals, and an occasional hug. Most of us who chose to homeschool our children are independent by nature, strong people, and very family-oriented. Parents of children with special needs have additional factors which may further alienate us from family and friends — even other homeschooling families. But, God did not create us to make this journey alone. In His Word, we are encouraged to bear one another’s burdens (Galatians 6:2). But how do we get the help we need when there doesn’t seem to be any to accept? Plus, how do we, who are independent by nature, share our struggles! When our family began homeschooling in the late 1980’s, we were the first family in our county to do so. My husband pastored a small church which consisted mainly of senior citizens. I already felt isolated, but when we made the decision to homeschool, I felt further ostracized. My love for my children and my conviction that they could be best educated at home propelled my dedication. I began writing letters to the editors of local papers declaring the viability of homeschooling. Families started contacting me for information. I also heard from homeschooling families in other counties. We came together to form a small support group and began meeting to share field trips and play dates. It boosted my confidence and emotional well-being tremendously, as well as provided my daughters with community. We were blessed by reaching and finding others who needed community as much as we did. I don’t relish this challenge of “walking through the valley of the shadow of death” with my mother. I would much prefer taking meals and sending cards to others who walk this path. However, those who have walked this road before me are best equipped to minister to me at this time. They have the empathy that only previous experience can give. Oh, how I value their help in carrying this burden and their encouragement and prayers! SPED Homeschool recognizes how unique the need is for fellowship within the special needs homeschooling community. We have walked this path ahead of you. This is why we are endeavoring to create local support groups designed specifically to minister to the needs of your entire family. This new program is called SPEDStrong Tribes. Next week, we’ll be raising funds so we can start the process of creating the framework for these local groups. 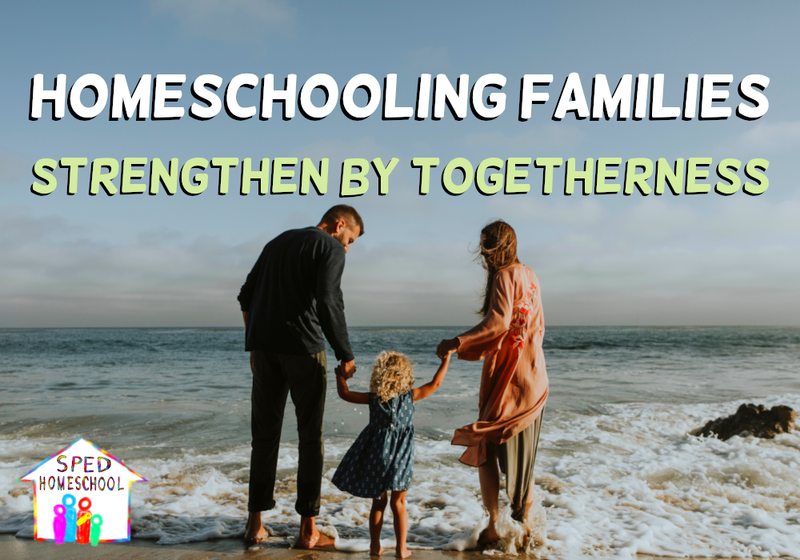 Through SPEDStrong Tribe groups, families who live in close proximity and who homeschool children with any type of special need will be able to come together and share life’s ups and downs as a loving and supportive community. We need your help to make SPEDStrong Tribes a reality. The funds we are raising on Giving Tuesday for this new program will be used to consolidate and build the structure and infrastructure needed to make duplicating these groups across the United States (and hopefully beyond) a seamless task. To find out more on how you can help us develop local support groups for special needs homeschooling families visit our SPEDStrong Tribes Giving Tuesday campaign and keep SPED Homeschool in your prayers. God’s means and methods are infinite for both the needs of our organization as well as for your family. Together let us seek His wisdom and guidance for meeting all our needs, as we ask Him to show us all how we can lighten the load for one another.